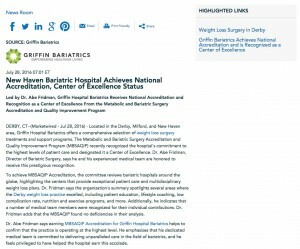 Led by Dr. Abe Fridman, Griffin Hospital Bariatrics receives national accreditation and recognition as a Center of Excellence from the Metabolic and Bariatric Surgery Accreditation and Quality Improvement Program. 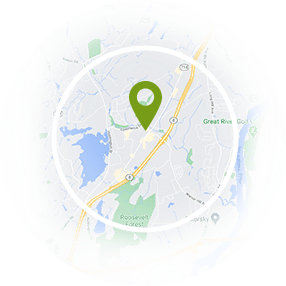 Derby, CT — Located in the Derby, Milford, and New Haven area, Griffin Hospital Bariatrics offers a comprehensive selection of weight loss surgery treatments and support programs. The Metabolic and Bariatric Surgery Accreditation and Quality Improvement Program (MBSAQIP) recently recognized the hospital’s commitment to the highest levels of patient care and designated it a Center of Excellence. Dr. Abe Fridman, Director of Bariatric Surgery, says he and his experienced medical team are honored to receive this prestigious recognition. To achieve MBSAQIP Accreditation, the committee reviews bariatric hospitals around the globe, highlighting the centers that provide exceptional patient care and multidisciplinary weight loss plans. Dr. Fridman says the organization’s summary spotlights several areas where the Derby weight loss practice excelled, including patient education, lifestyle coaching, low complication rate, nutrition and exercise programs, and more. Additionally, he indicates that a number of medical team members were recognized for their individual contributions. Dr. Fridman adds that the MBSAQIP found no deficiencies in their analysis. Dr. Abe Fridman says earning MBSAQIP Accreditation for Griffin Hospital Bariatrics helps to confirm that the practice is operating at the highest level. He emphasizes that his dedicated medical team is committed to delivering unparalleled care in the field of bariatrics, and he feels privileged to have helped the hospital earn this accolade. Griffin Bariatrics is comprised of a team of bariatric surgeons who are extensively trained in a comprehensive selection of weight loss procedures. Additionally, the Griffin Bariatrics community offers pre- and post-surgical support programs that help patients achieve successful long-term weight loss. Griffin Hospital is a part of the Planetree network of hospitals, which emphasizes exceptional care, patient education, and personal empowerment. For more information about Griffin Hospital Bariatrics, please visit griffinhospitalbariatrics.com and facebook.com/Griffin.Bariatrics.